Meteora... Does the name ring a bell??? For most people it doesn't but this jewel of Greece has to get known to more people and in this travelogue I'm gonna tell you about it. 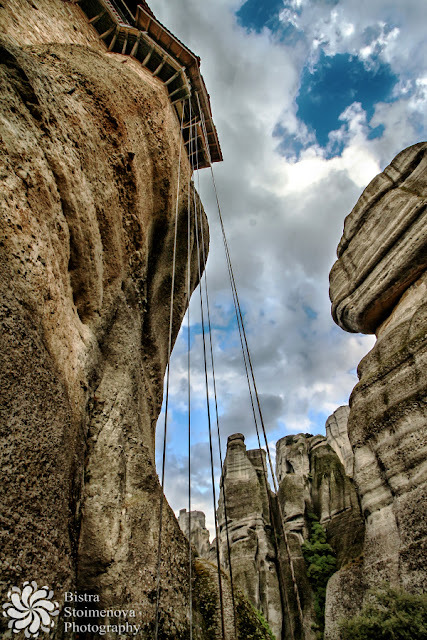 It's Easter time so it's only natural that I will be talking about a Holy place - a few are as spectacular as Meteora! 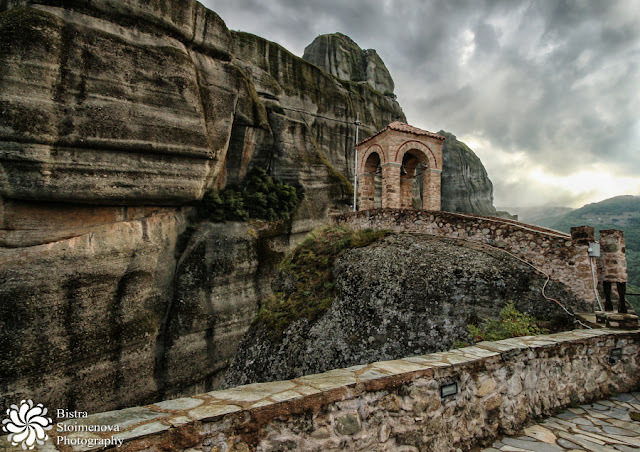 Meteora is situated in central Greece - in Thessaly, if that rings a bell. 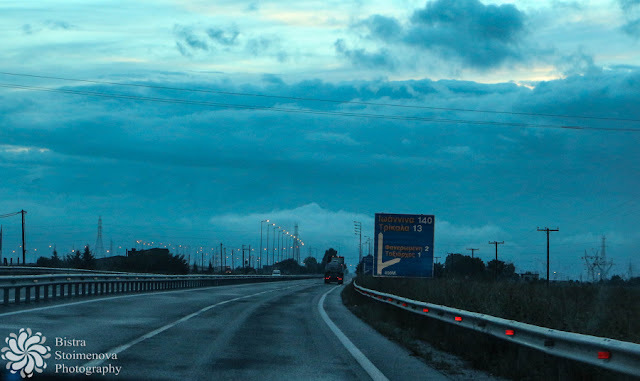 The nearest big town is Trikala and the nearest small town is Kalabaka (transliterated as KalaMbaka in Greek roadsigns but you read only the B sound because the orthographic combination of the MP letters is read as B in Greek). Anyway, Meteora is in the middle of the continental part of the country, near one of the highest mountain ranges - Pindus Mountains. Here is where Meteora is on the map. There are - as always - two ways. Both, however, involve having a car. There are great motorways up till Trikala and then there is a good first-class road that leads to Kalabaka. Meteora is roughly 350 km away. If you come from some other country - like Bulgaria - it is less (because it is closer to the border.) In any case, you'll need a car to go round the place. Once you get there, there are some hiking tours and loads of things to do but still - if you ask me - don't underestimate the car. In Greek, Μετέωρα means "middle of the sky", "suspended in the air" or "in the heavens above". The Greeks gave that name to the place because of its unique look. 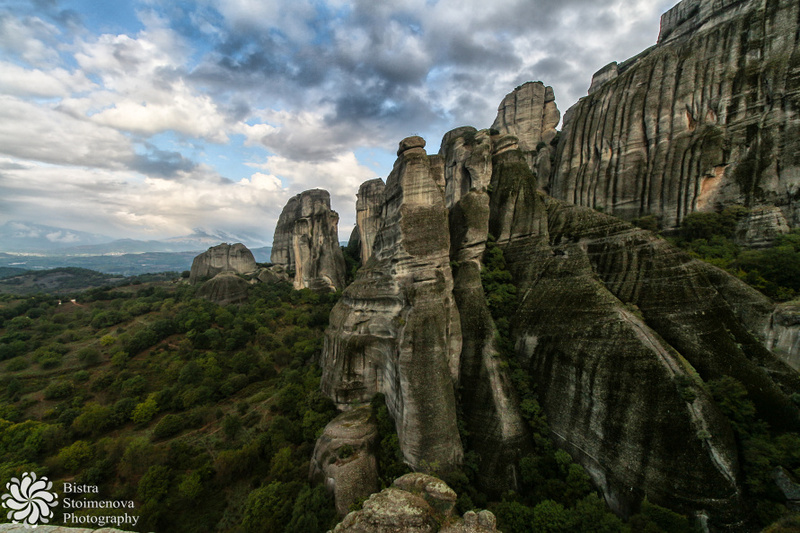 The name stands for a unique rock formation in the plain of Thessaly. The sandstone pillars, as they are called, show that at some point of its geological history, that part of Greece was below sea level. The same idea, "suspended in the air" or "in the heavens above", goes for the complex of monasteries build on top of some of the pillars. They look like birds nests from below and really, you start wondering how did they make them in the first place. The answer is - with baskets and a lot of ropes. Everything that is up the stone pillars now was brought up in a basket - brick by brick, stone by stone. The place looks surreal and no wonder that it was a favorite place of hermit monks as early as the 9th century AD. They lived in caves inside the pillars and the predecessors of the monasteries were built in the 12th century. The biggest monastery of the complex, The Great Meteoron, was founded in the 14th century. 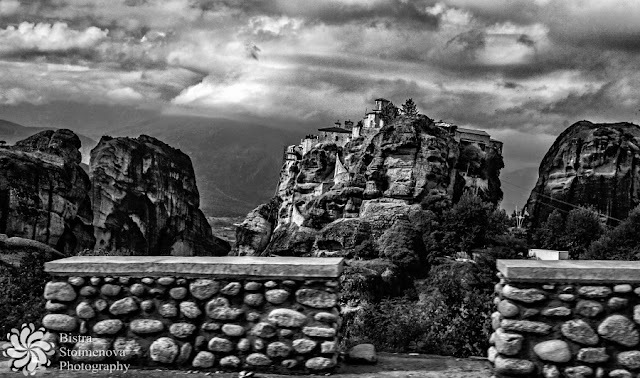 At that time, the Ottoman Turks invaded the area so the rock pillars proved to be the ideal hiding place for the hermit monks. They built more than 20 monasteries up the pillars but only 6 remain today. From the list above - you have 2 monasteries closed on Friday and one each other day of the work week. If you go on Saturday and Sunday - you will see the monasteries open but you will not be the only visitor. Meteora is very popular in Greece (and virtually unknown outside it) so expect a lot of tourists. 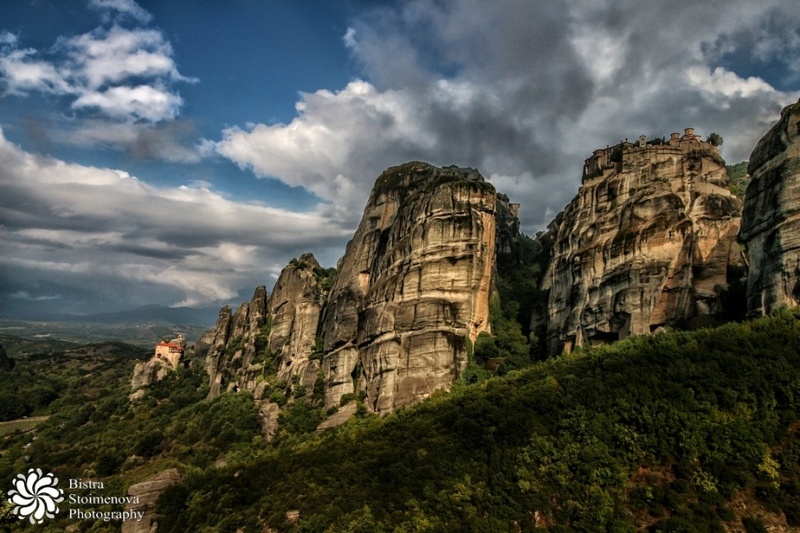 Moreover, Meteora is part of UNESCO World Heritage list so there are even more tourists. Hint: they usually visit places at noon, so they are relatively easy to avoid. What I highly recommend is getting a place to sleep in Kastraki (the nearest village to the monasteries) or Kalabaka (the bigger town) and then spend two days there and see all monasteries. Thus, if the weather is bad you have one more day to sort things out. All monasteries are currently in use so you are NOT entering a museum - keep in mind that photos INSIDE THE CHURCH are STRICTLY FORBIDDEN and you should be dressed properly - some info for the ladies - even if you wear jeans and not shorts, you'll be given a skirt - Greek Orthodox Church rule - if you are a female, you enter church in a skirt. No exceptions (only little girls are allowed to enter in jeans and the rest). Now that you have been warned, you know what to expect inside. Meteora had been on the list for quite some time but, since it is relatively close to Bulgaria, I always left it for some later time. When I finally included it in the list, it was a tough call. Last item on the sightseeing list, and even that - we had to cross half of continental Greece (traveling from Delfi) and arrive in Kastraki in the evening. Then, the next morning up till noon was reserved for visiting some of the monasteries and then - off we go to Bulgaria. As you can see, visiting all the monasteries, even if we had actually come during the weekend, was out of the question. 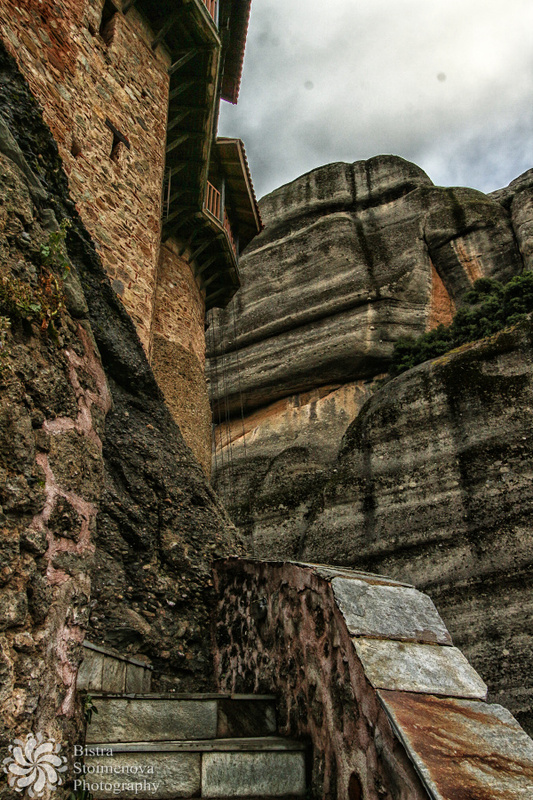 Biggest nunnery at Meteora - the other nunnery, Roussanouq is much smaller. The monastery is close to the Great Meteoron and it is easily accessible by car but when I was 11 they didn't let people go further than the yard. You can visit the church of course, but not much more. I don't remember it having any view - or if it had, we didn't see it. Small nunnery with amazing view to Great Meteoron, St.Stephen's nunnery and Varlaaam. 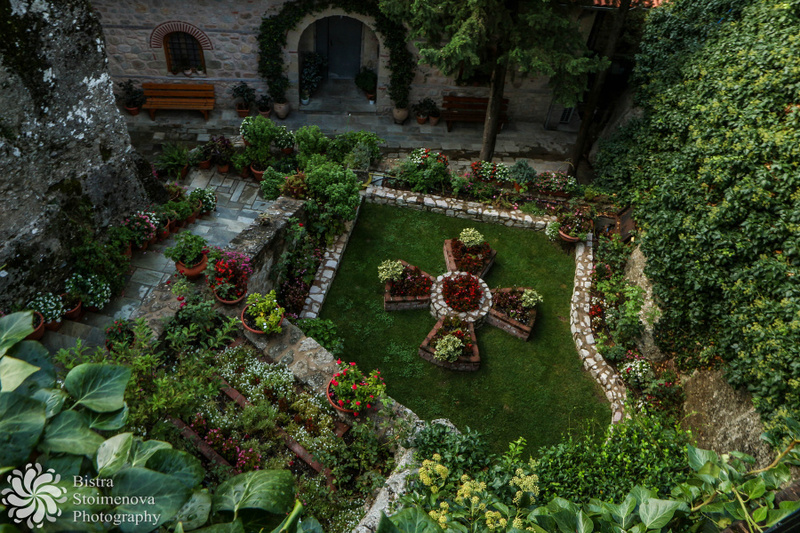 You get up there by stairs (not too many don't worry) and the monastery itself is a small and cozy one. In all monasteries you can buy some souvenirs (usually handmade and sold by the monks and nuns - the older don't speak much English but they will sort you out) but the biggest variety is, as usual, in the Great Meteoron. Roussanou is deffinitely worth the visit and if you visit some of the three above (Great Meteoron, St.Stephen's nunnery and Varlaaam) try to capture Rousssanou from there - it is a spectacular view - a small monastery at the summit of a stone pillar. It's in the middle of the rock formations so from it you have view to all other monasteries. It is relatively big and quite visited by tourists - mainly because of the amazing view. Definitely a must-see if it is open! Even if it is not - stop at the parking and take a picture of it - you won't regret it. 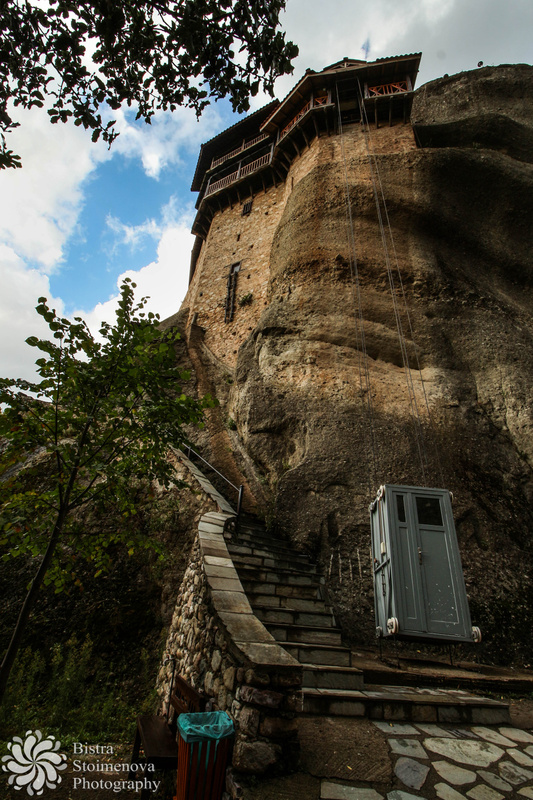 The smallest of all monasteries. If you ask me, this one is the most authentic one. By far, it is on the lowest stone pillar and the view towards Kalabaka and Kastraki is great. 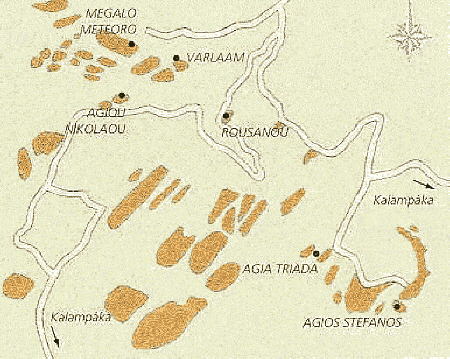 Agios Nikolaos is the closest to Kastraki. It has a small parking and usually big tourist groups bypass it. It is really small (I mean REALLY) and you can get up there by climbing quite a lot of stairs but the climb is worth it. Agios Nikolaos is the only monastery where you can still see the old basket-and-rope structures that were used to build Meteora and to bring up supplies. Well, it's a bit modernized, bu still. You can get the overall impression, especially if you imagine that happening with one of the higher pillars. No matter which monastery you visit, take a time and buy a candle - thus you respect the place and use the time to say a prayer or two - no need to be a devout Christian to do so - just wish for good health and happiness, that's enough. Advice - choose a place with a view - Meteora is amazing at sunset and at night! Kalabaka or better still - Kastraki, are the wisest choices, if you ask me. In that part of Greece, it is generally hot in the summer. That goes only for the day, at night it can be rather chilly so - bring a jacket (you'll thank me later). 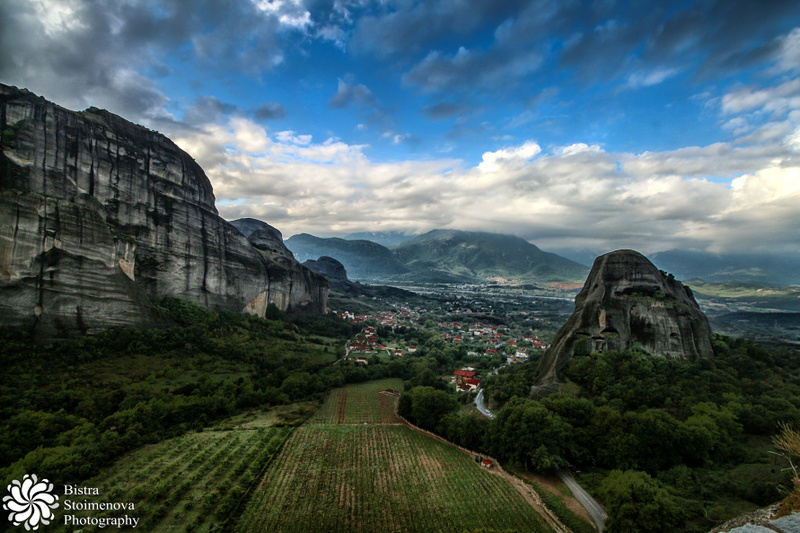 Meteora is quite rainy and misty in spring and autumn so keep that in mind. Jeans and a T-shirt would do. Remember what I said here about how to dress in Orthodox churches and monasteries. I know I'm getting kind of boring with that but if you visit such a place, you should show some respect. Bring comfortable shoes (I mean really COMFORTABLE) - sneakers would do. It is quite windy up on the pillars so if you bring a hat - hold on to it. There is no way of going to Meteora and returning without nice pictures. The place is just so amazing that you will capture at least a few things that are stunning. Here are a few things to keep in mind. There would be climbing so don't take all your lenses with you. 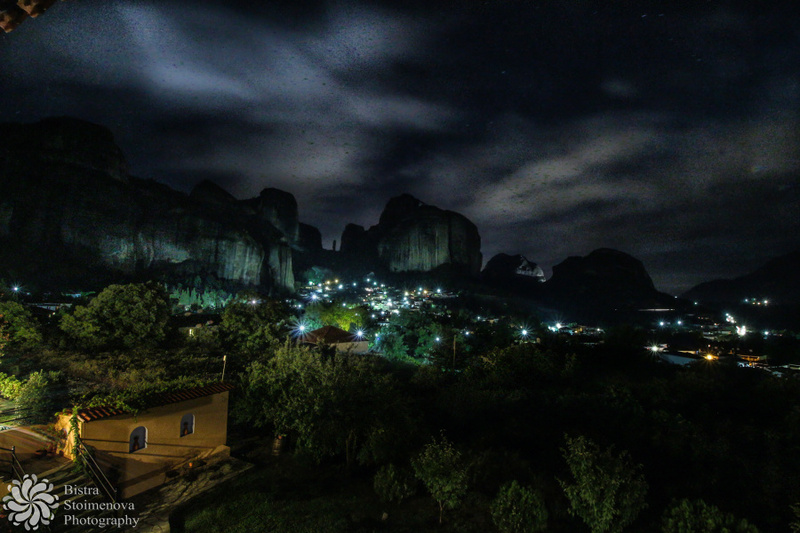 Meteora at night - exposure - around 5 minutes. That's why you need a tripod! Keep shutter speed at at least 1/200 sec. - that way camera shake will not be a problem. Keep an eye on the light and avoid shooting when the sun shines in your lens - unless you have a DSLR and shoot in RAW format you won't be able to see much in them. Keep ISO as low as possible (you'll thank me later about that). 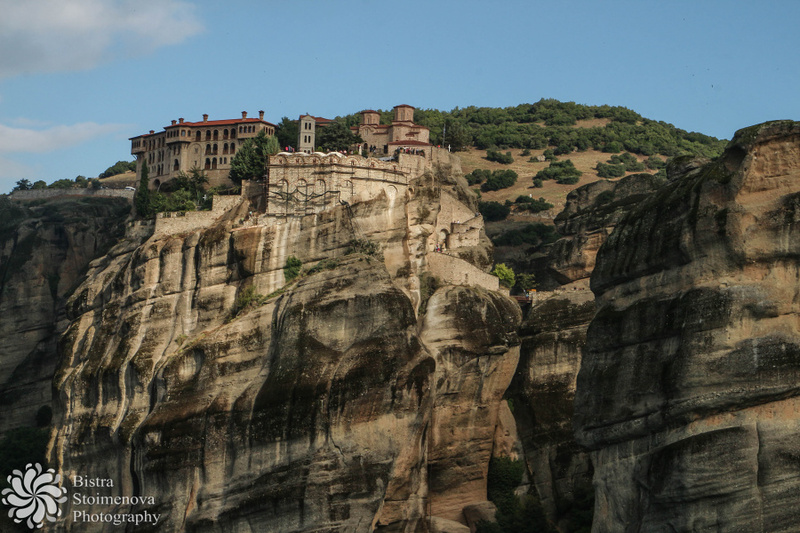 Meteora is amazing to shoot at the Golden Hour ( around 10 am and around 4 or 5 pm in summer). Morning is good but only for some locations, same goes for evening. Keep in mind that there will be areas that are bright in the sunlight and others that will be in the shadow - that goes especially for the summits of the stone pillars. 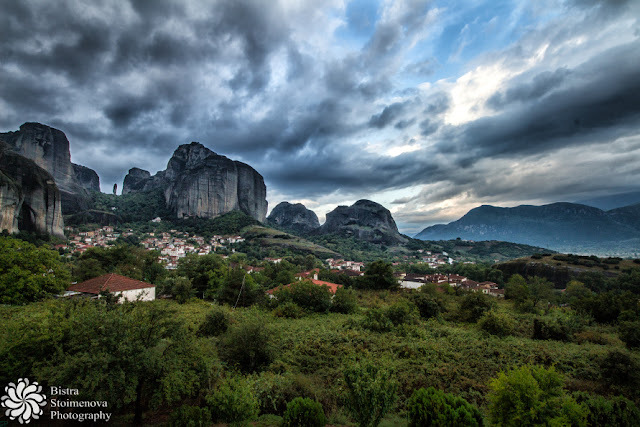 The only way to get them well-lit is to visit Meteora when it rains or it is about to rain. 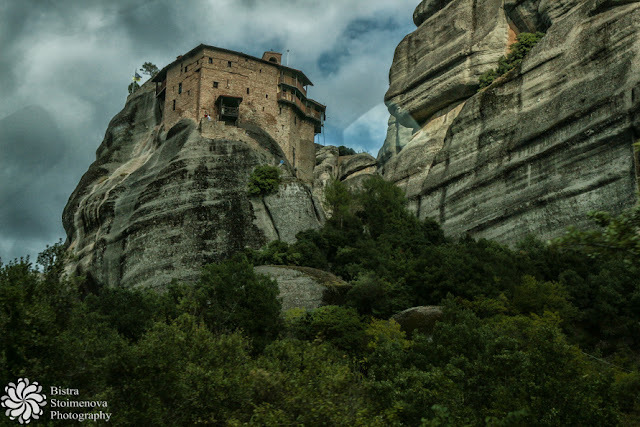 Meteora is in Central Greece so people there are different from what you will encounter in Peloponnese or Crete. The traditional hospitality is still there but people tend to be less 'open' and more like the people in Bulgaria (which means - frowning and not exactly hospitable). This is a personal opinion - which may be due to the fact that I visited the place in a cold and rainy evening in September. Still, the food is great (as anywhere in Greece) - try the local wine and the meat - you'll see few types of fish here but the rest is delicious. Bring in a torch - streets of Kastraki do have some lamps but they are not enough - it all depends on where you'e staying. Bring in an umbrella as well - you never know when it's going to rain there. 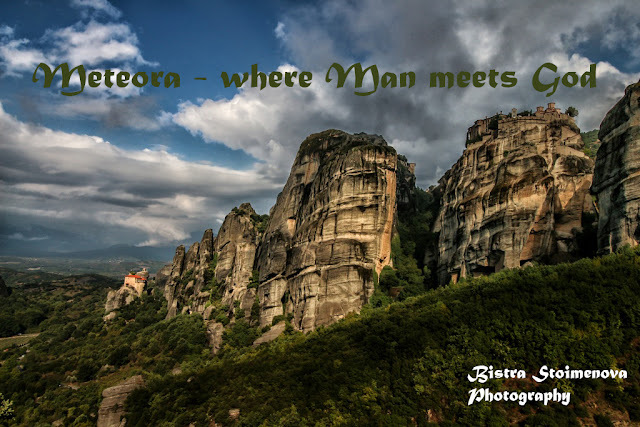 Having said all that, I wish you a wonderful Easter and can't wait so see your pictures from Meteora! Posted by Bistra Stoimenova at 18:02 ч.